Electrical conduit provides a barrier between electrical wires and the environment. This keeps the wires protected and people's hands away from the electricity. "Smurf tube" is the nickname for a type of flexible conduit that is blue in color and made from PVC, and "Smurf tube 2" has a diameter of 2 inches. It can be bent with your hands to make the installation a simple project. Be careful to limit the number of bends to a total of 360 degrees in a full run to facilitate the fishing of electrical wire at the end. Determine the starting and ending point of the conduit run. Measure the length of the run with a measuring tape. Transfer this measurement over the the Smurf Tube 2 conduit and mark the location with a marker. Hold the conduit on a solid surface with the marking just over the edge. Cut the conduit at a slight angle with a hack saw. The purpose of the angle is to cut through only one metal ribbon in the tube. Hold the conduit against the wall in the starting location. 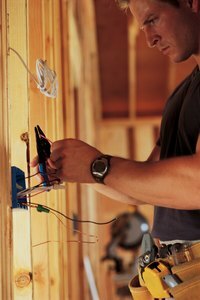 Fasten it to the wall within 2 feet of the start with a conduit support, screw and drill. Fasten a support to the wall every 3 feet of conduit. Fasten a conduit support within 2 feet of the end of the run.